Channel letter signs are a great way to identify and brand a business. These 3-D signs capture the attention of customers and attract new clients driving by thanks to individual lighting on each letter and colors and fonts that match the business's branding. In order to choose the best option that fits in with your small business needs, it's helpful to learn the basics. Banks, office buildings, retail stores and hospitals are some of the common buildings that display channel letter signs. 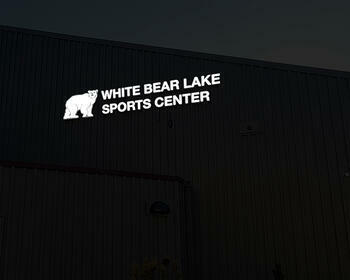 These three-dimensional graphics feature individual letters with separate illumination for a clean, finished look. Because there is a wide variety of colors, fonts and sizes, you can design a unique letter pattern that lets customers immediately connect with your brand. The basic characters include letters, numbers, punctuation and other symbols, and each element is constructed from lightfast materials, such as aluminum sheeting and acrylic, to help maintain its appearance and to ensure long-lasting use. What Type of Channel Letter Signs are Available? The most common channel letter signs are front-lit, or standard, characters. They have an acrylic face, aluminum returns and backs, and trim caps. These signs are completely customizable and have LED modules hidden on the interior of each letter. Since they can be seen from greater distances, front-lit channel letters work well if you want to attract the attention of drivers passing your business. Choose brilliant LED illumination and thick letters to make them easier to read from far away. Halo channel letters are also called back-lit or reverse channel letters. This channel letter signage helps you create a classy look and is ideal for businesses that want to convey a softer image. Instead of using an acrylic face, reverse channel signs use metal faces and have aluminum returns. Letters are mounted with a 1.5-inch or greater separation from the building, resulting in a halo effect that engulfs the perimeter of each element. Halo channel signs work best against light-colored stucco, aluminum or concrete. It's often not the best options against dark masonry, such as block or brick construction. These materials tend to absorb or distort the light for a dimmer effect. Combination-lit channel letters use clear backs customized with translucent vinyl graphics that result in the halo color of choice. Channel signs with red letters and a blue halo are an example of combination-lit channel letters. What are the Best Mounting Options for Channel Letter Signage? There are three main mounting options for these signs: raceway, direct mount and backer mount. Often, property management companies insist that channel letter signage is mounted on a metal box, or raceway, that incorporates the wiring and power for each letter. This mount type reduces the number of holes required for the installation. A direct mount, also known as a flush mount, is installed directly on the facade via non-corrosive fasteners. For reverse channel letters, standoff spacers provide an unobtrusive mounting option. With direct mount channel letters, the power and electrical wiring are housed behind the facade. When backer mounting is used, the letters attach to a metal cabinet, or backer panel, that's larger than the channel signage. The power supply and wiring can are housed in the backer panel or behind the facade. How are Channel Letter Signs Priced? Each channel letter sign is a custom creation due to the number of factors that can vary, such as letter thickness, depth and height. Before placing an order talk to an experienced and reliable custom sign provider. 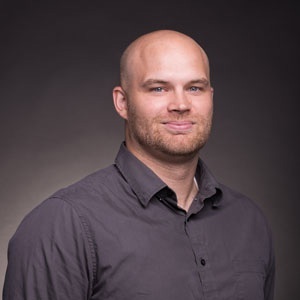 You'll get a straight answer to all your questions and advice on how to design the right sign to help your customers find your business quickly. How Can I Use Channel Letter Signage? 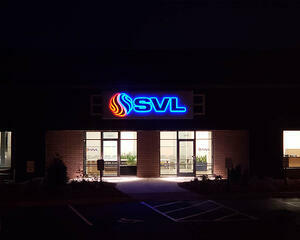 Channel letters help your clients form an impression of your business. They are an integral piece of your branding package. Businesses from large franchise to small family-owned operations rely on channel signage to attract and direct clients to their front doors. Here are a few tips to help you make the biggest impact. Keep the font simple and stick to the basics. If customers can't read your sign, they aren't likely to seek you out. If you aren't familiar with the zoning or property management restrictions, get that information before you desire or order your signage. Even if there are no specific restrictions, it's vital that you understand how your signage fits into the area. For example, flashy colors and billboard size letter may not be appropriate in, say, a historical zone. Find a custom sign provider that stays up-to-date on local ordinance and building restrictions and who is willing to walk you through the process. Don't cut corners. This is a one-time purchase that begins paying for itself as soon as it draws the first customer in the door. For instance, if you use low quality LED’s, your sign won’t be as bright as your competitors, and it will fade and dim faster. Ask for high-quality acrylic that has a high colorfast rating so that your blue, red, yellow, green, purple, or orange letters stay brilliant. If you've decided to invest in your business with channel letter signage, you've taken a step that pays immediate dividends. Customers notice when a business goes the extra mile and they will be able to find and remember your business when they need it.